A brilliant selection as favors for a baby shower or christening, these crystal baby booties are perfect keepsakes that can also be used as adorable accompaniments to your baby announcements. Each 2" x 1.125" favor, from the exclusive Choice Crystal by Fashioncraft line, features a radiant crystal baby bootie, accented with a shiny silver metal bow. 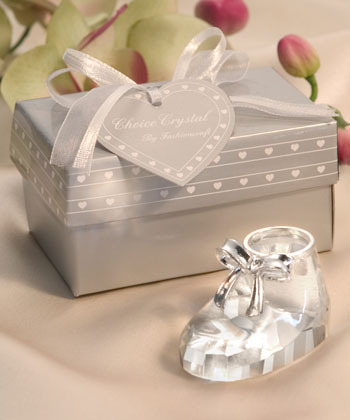 Surrounded by satin inside a Choice Crystal signature silver heart design box (3.25" x 2.25"), tied with an organza and satin bow with a crystal heart on top and an attached matching heart shaped tag, these favors make for a stunning presentation.